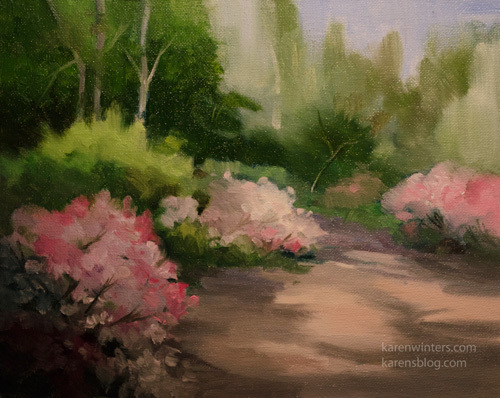 Descanso Gardens is the closest botanical garden to our home, and it’s my go-to place whenever I want to do some plein air painting in an expansive and beautiful setting. 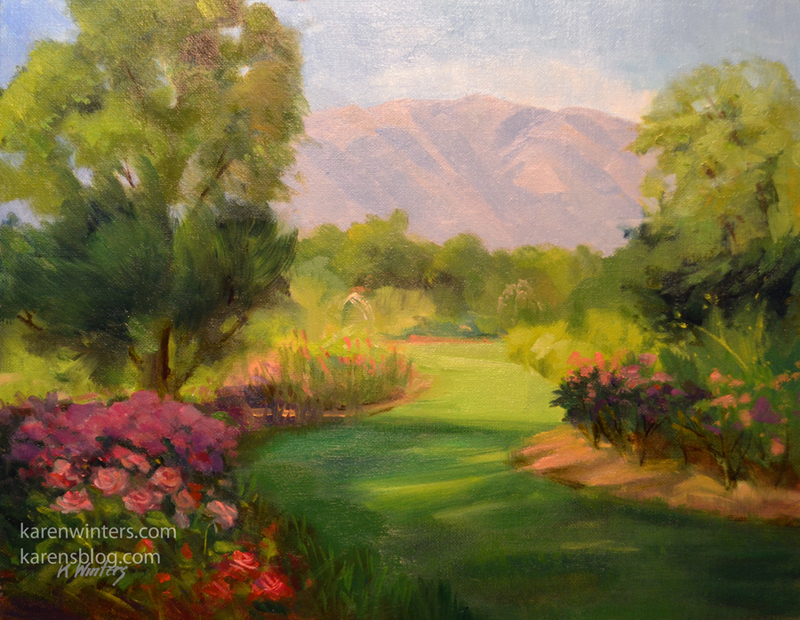 This pathway is one that I have painted through the seasons and from different viewpoints. The San Gabriel Mountains can be seen in the distance, which also tower over our own home. 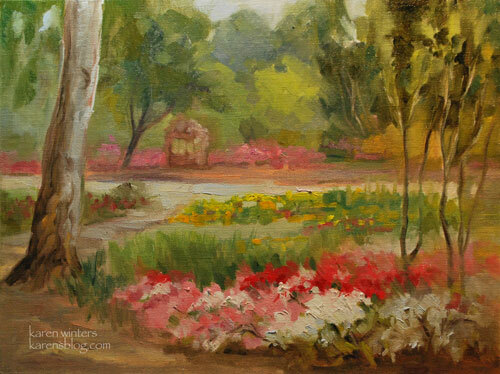 The international rosarium is not only a rose garden but also contains many other perennials and flowering shrubs. 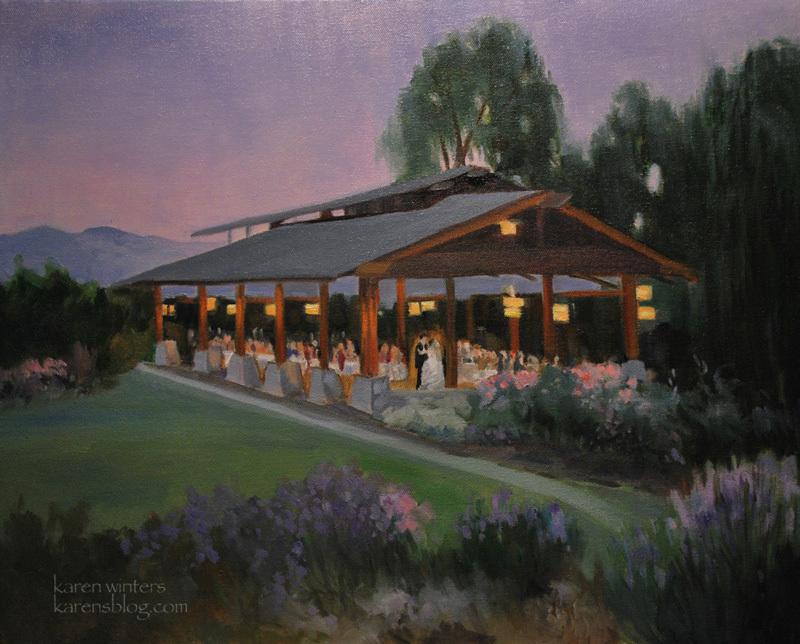 It’s just a peaceful place to visit, and in which to picnic on selected summer evenings. 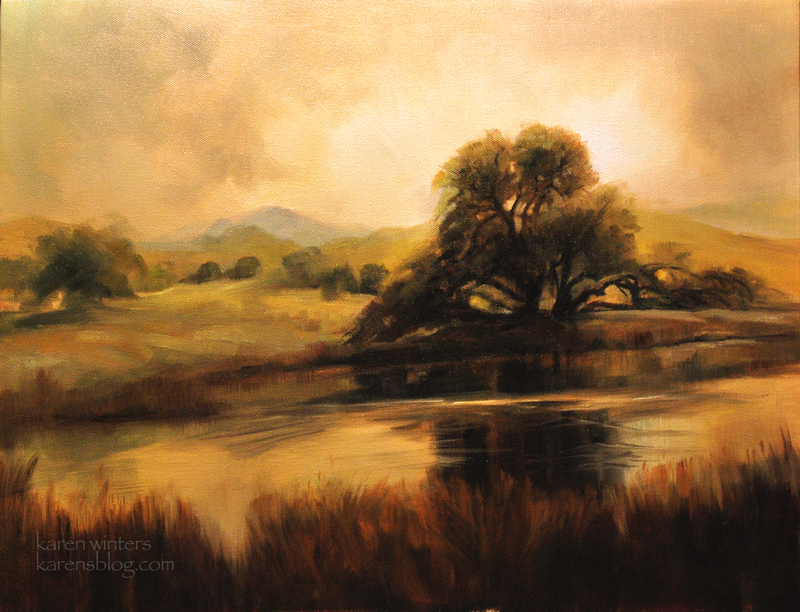 I took this new painting “Sunset on Descanso Pond” to the Colony Theatre in Burbank today for a solo show in conjunction with their presentation of “On Golden Pond,” running from July 27 – August 28, starring Hal Linden. There is a cozy gallery area inside the theater with plenty of room for the seventeen paintings I brought. Not all the paintings are of ponds or lakes, of course. There are eastern Sierra scenes, vineyards, seascapes and more. 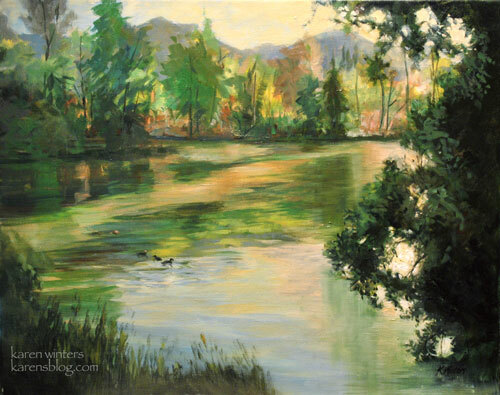 Sunset on Descanso Pond features the bird sanctuary area, where waterfowl, turtles and other types of wildlife abound. We used to enjoy visiting that spot often when the children were young and feeding or stale bread to the ducks and geese was permitted. 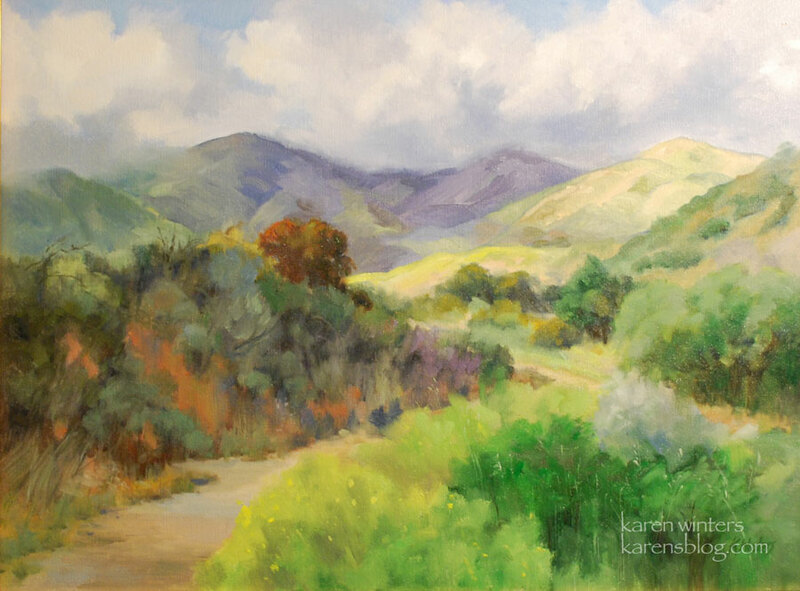 Below is the Central California landscape that I painted expressly for this show as a theme piece. The title is “Return to Golden Pond” and it is 14 x 18, oil on canvas. 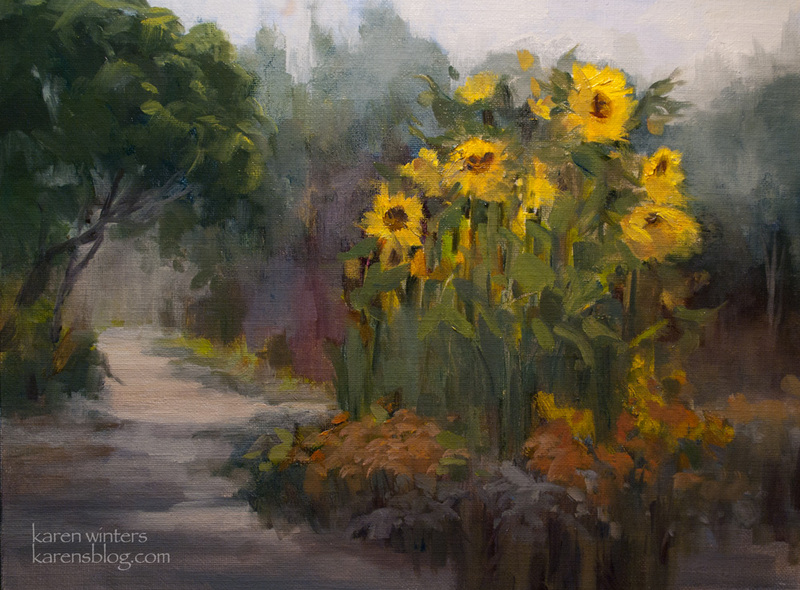 Last autumn, when the flowers were completing their blooming season at Descanso Gardens, I painted this stand of Mammoth Sunflowers, caught in the afternoon sunlight. By the way the heads were bowing, I knew they wouldn’t last too much longer. The camellias are in bloom now, and I am looking forward to the tulip show at Descanso, if they have planted them this year. Painting note: although the underpainting was done with thin transparent darks, the opaque paint on top was painted with a very limited palette of red, yellow, blue, white and gray. 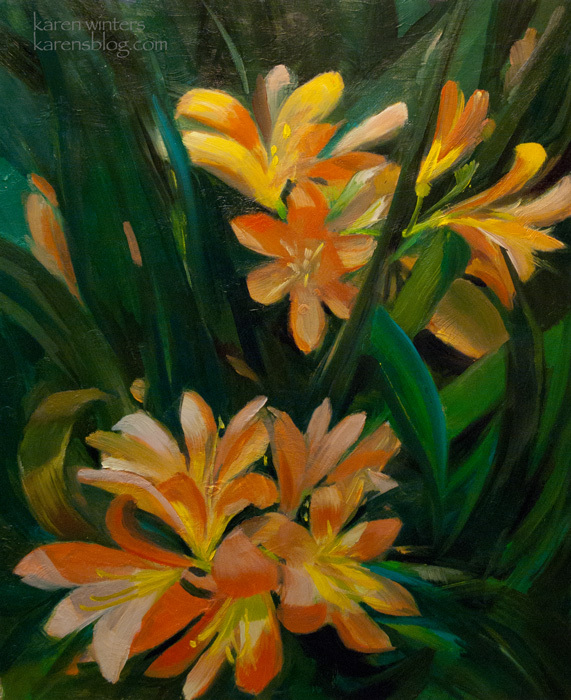 Amazing how many colors you can get from those few primaries. 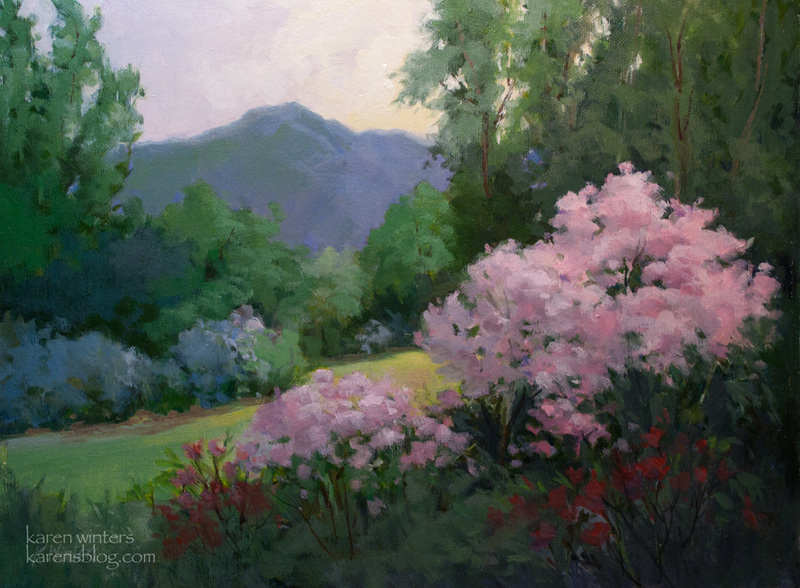 Along with the bountiful spring bulbs at Descanso, the azaleas are in full bloom, a temptation for the plein air painter. 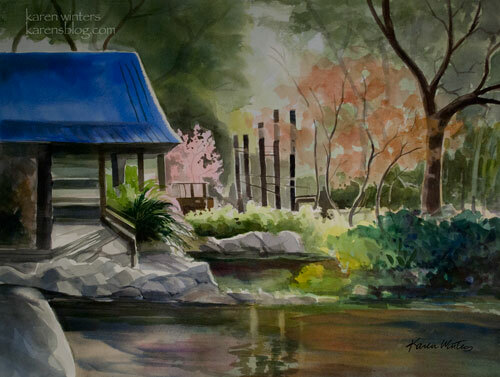 This scene prompted me to paint mostly with red-green complements. Wishing everyone a beautiful Easter!